TSS: February Wrap-Up, Bring on Spring! Even though it's the shortest month, February always drags for me. Winter begins to take it's toll and cabin fever sets in. We long for spring but, around here, it's still a long way off. Thank heavens there's March Madness to look forward to! It's college basketball that helps us get through the winter! Last night at the Carrier Dome, an NCAA on-campus attendance record was set as 34, 616 fans watched the #4 Syracuse Orangemen defeat the #7 Villanova Wildcats. 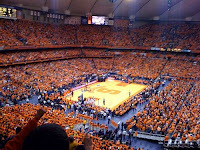 Just look at that sea of orange! No, I wasn't one of the lucky ones present. I had to settle for television, but will get all the details from my Dad later today. We had almost 30" of snow Thursday and Friday. Schools were closed, but my book club is a hearty group. Our meeting went on as scheduled! We had a wonderful discussion of Sarah's Key, and I promise to get my review/discussion highlights up later this week! Next month we're reading The Help. That should give me a chance to work on my tbr pile, since I listened to it last year. There are a few February awards to acknowledge. Madeleine at Wordbird gave me the Honest Scrap Award. I've played along with this one, so I'll direct you to Madeleine's 10 things. Have a look around while you're there. 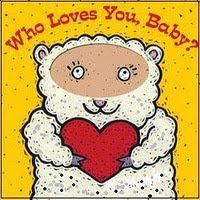 Around Valentine's Day, Candace at Beth Fish Reads gave me the Who Loves You, Baby? button. Isn't that sheep the cutest thing? Thanks so much Candace. Where is your favorite place to read a book? Do you snack while reading? 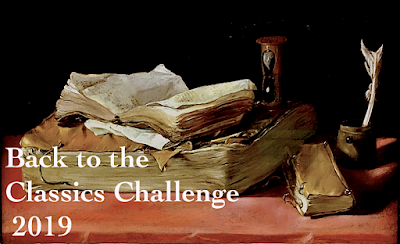 Are you a book borrower or book collector? A collector - I love to be surrounded to books!! 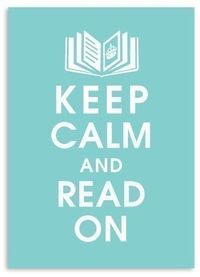 What is the best book you've read recently? Thanks so much Madeleine, Candace, and Kals! Finally, this week I will be reading South of Broad by Pat Conroy and listening to Julia Child's My Life in France. What do you have planned this week? Weekend Cooking, hosted at Beth Fish Reads, is open to anyone who has any kind of food-related post to share: Book (novel, nonfiction) reviews, cookbook reviews, movie reviews, recipes, random thoughts, gadgets, fabulous quotations, photographs. If your post is even vaguely foodie, feel free to grab the button, head over to Beth Fish Reads, and link up anytime over the weekend. This weekend I am returning to Secret Ingredients: The New Yorker Book of Food and Drink. Calvin Trillin's 2002 essay "The Red and The White" deals, of course, with wine. In it, he addresses the question of whether experienced wine drinkers, in the absence of color and temperature cues, can actually tell the difference between red and white wines. "...when I'm trying to select a bottle of wine from a liquor store I'm strongly influenced by the picture on the label. (I like a nice mountain, preferably in the middle distance.)" "Displaying manners that I thought would have made my mother proud, I drank what was placed before me - not noticing, as I glanced around to see whether more food was ever going to appear, that everyone else was just sipping. I have since heard two or three versions of what transpired that evening, but they do not differ in whether or not I fell asleep at the table." He also observes "... wine is way beyond any other subject in inspiring in the American layman an urge to refute the notion of expertise. (Modern art must come in second)." Still curious, he approached a Napa Valley wine-making friend and proposed to round up a small group of "wine people" for the red-white test. An informal test was given, using methods suggested by the UC Davis professor... all wines at the same temperature, black glasses, some even wearing sunglasses! And the result of this unscientific test? When there is no deliberate effort to fool the tasters, experienced wine drinkers could distinguish between red and white wines 70% of the time. So tell me... will you be conducting your own temperature-controlled, black glass wine-tasting this weekend? I'm thinking it might be fun. Cheers! Visit Beth Fish Reads for more Weekend Cooking posts. All are paperbacks and in good (Speak) to very good condition. I'll ship them anywhere. Let me know if one interests you. All the books have found a new home! Please send me your addresses and I'll send them out. My book club will discuss Sarah's Key on Thursday. 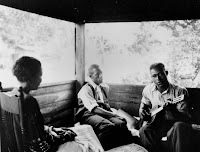 With Black History Month in mind, "The Eatonville Anthology" by Zora Neale Hurston (1891-1960) is the subject of this week's Short Story Monday post. 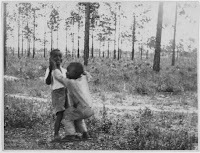 It is a series of vignettes, or snapshots, from a small African-American community in central Florida in the early 20th century. There doesn't seem to be anything holding the snapshots together but, taken as a whole, they provide an interesting look at life in the town. The fourteen vignettes are headed with Roman numerals; some also have a title. They range in length from just a few sentences to a couple of pages. Each begins with a general statement of character, and then continues with either a few details or an entire sketch. Most are about specific people, but one is about a family dog, and another features the fable-like quality of talking animals. According to Hurston biographer Robert E. Hemenway, "The Eatonville Anthology" mixes well-known folklore with original material. "Daisy Taylor was the town vamp. Not that she was pretty. But sirens were all but non-existent in the town. Perhaps she was forced to it by circumstances. She was quite dark with little bushy patches of hair squatting over her head. These were held down by shingle-nails often. No one knows whether she did this for artistic effect or for lack of hairpins..."
Daisy flirted with married men. There were only two single men in town. She'd come on to Mr. Crooms one time too many and his wife, Laura, seeing an opportunity, could no longer contain her anger. "There was a box of ax-handles on display on the porch, propped up against the door jamb. As Daisy stepped upon the porch, Mrs. Crooms leaned the heavy end of one of those handles heavily upon her head. She staggered from the porch to the ground and the timid Laura, fearful of counter-attack, struck again and Daisy toppled into the town ditch. There was not enough water in there to do more than muss her up. Every time she tried to rise, down would come that ax-handle again...."
"Is she hurt much?" Joe Clarke asked from the doorway. "I don't know," Elijah answered, "I was just looking to see if Laura was lucky enough to hit one of those nails on the head and drive it in." Before a week was up, Daisy moved to Orlando. 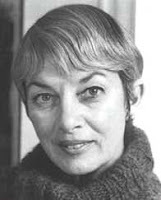 There in a wider sphere, perhaps, her talents as a vamp were appreciated." In 1887, Eatonville became the first incorporated African-American community in the nation. Some 100 such communities were founded during that era, but only about a dozen remain. 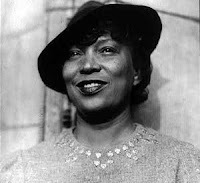 Today, Eatonville is best known for its annual showcase of arts, literature and culture that celebrates its native daughter, Zora Neale Hurston. The novel portrays an imaginary chain of events unfolding around Philippe Petit's actual high-wire walk between the Twin Towers of the World Trade Center in August 1974. We meet the Park Avenue judge who hears the case, his grieving wife and other members of a group mourning sons lost in Vietnam, heroin-addicted Bronx prostitutes (including a mother-daughter duo), an Irish radical monk and his brother, young artists, and even computer geeks from California. I started out listening to the audio version of Let the Great World Spin. It features seven readers, and the story unfolds from multiple points of view. These narrators offer wonderfully distinctive voices, which are especially effective as some sections are told in the first person. After listening to the first couple disks, there were passages I wanted to reread and questions about the novel's structure to be answered, so I borrowed the book from the library. From that point, I listened in the car and read on at home in the evening. I remain in awe of an imagination that can plot such intricate stories and then weave them together with a common thread. "I don't know who God is but if I meet him anytime soon I'm going to get Him in the corner until He tells me the truth. The final section takes place in 2006. The events are looked upon with a post- 9/11 eye. Indeed! 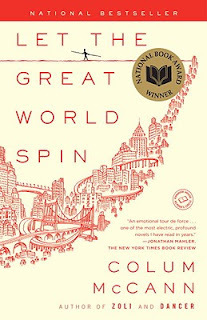 I loved Let the Great World Spin, and can certainly see why it won the 2009 National Book Award for fiction. Highly recommended. A note of caution: DO NOT read the Publisher's Weekly summary on Amazon. It contains spoilers. FTC disclosure: The audio was purchased from audible.com. The book was borrowed from the library. It's overdue - I want to keep it. 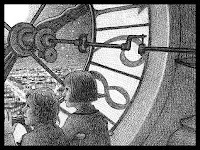 “Orphan, Clock Keeper, and Thief, twelve-year-old Hugo lives in the walls of a busy Paris train station, where his survival depends on secrets and anonymity. But when his world suddenly interlocks with an eccentric girl and the owner of a small toy booth in the train station, Hugo’s undercover life, and his most precious secret, are put in jeopardy. 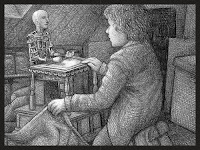 A cryptic drawing, a treasured notebook, a stolen key, a mechanical man, and a hidden message all come together…in The Invention of Hugo Cabret. I've read only a handful of graphic novels and couldn't tell you the last time I picked up a children's book (my 'babies' are 16), but this review at Ready When You Are, C.B. 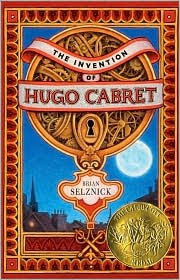 convinced me to find a copy of The Invention of Hugo Cabret right away. The book is aimed at 9 to 12 year olds, but I think it would actually appeal to a much wider audience. My teenage nephews would love this! The size of this 500+ page hardcover "children's" book initally shocked me, but that quickly passed as I lost myself behind the walls of that Paris train station. The Invention of Hugo Cabret is pure fun at any age! It's winter break! School is out, the twins are home, my husband has a couple of days off... there may not be much blogging this week. Our main activities will include college visits with Twin A (Twin B gets her turn in April), reading, catching up on movies, shopping, trying a few new recipes, and walking in the snow. I finished a couple of books last week - Marcelo in the Real World by Francisco X. Stork and Sarah's Key by Tatiana de Rosnay. 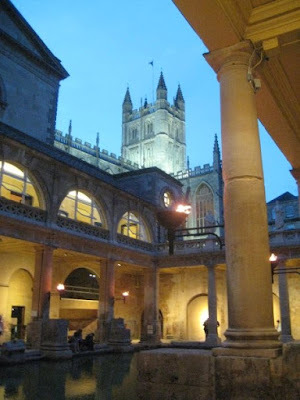 So now, in addition to Let The Great World Spin by Colum McCann, I'm three reviews behind. One morning must be devoted to reviews! And finally, a winter weather tidbit. Baltimore edged out Syracuse, NY last week for first place in the snowiest city in the US competition! Syracuse has received about 76" so far and we're on track to receive out usual 120 inches. Baltimore was at 79.9" on February 10. I'm sure this is a competition they would rather not win! Read all about it here. I hope you're enjoying this Valentine's Day. Are you reading, having a romantic dinner, or maybe digging out from the latest round of snow? It's been a few weeks since I've participated in Weekend Cooking hosted by Beth Fish Reads. The last few Saturday mornings have found us in hotels (traveling to Daughter #1's college basketball games), but the games are 'home' this weekend. That means more time in the car driving back and forth both days, but at least we get to sleep in our own bed! While preparing one of my favorite dinners earlier this week, I couldn't help but think of "Weekend Cooking". 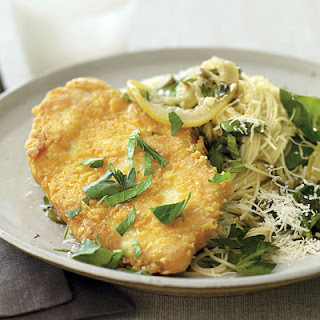 The Parmigiano-Reggiano Crusted Chicken Picatta from EveryDay with Rachel Ray magazine is just delicious... and so quick and easy! My husband and daughters seriously questioned my sanity as I tried to photograph their dinner, but I wasn't deterred. In the end though, my pictures were terrible. This one appeared in the magazine. There's a reason they professional food photographers! Place the flour on a plate. In a shallow bowl, beat the eggs; place 1 cup cheese on another plate. Working with 1 cutlet at a time, coat the chicken with the flour, then egg, then cheese, pressing to adhere. Transfer to a plate. Bring a large pot of water to a boil. Add salt, then the pasta and cook until al dente, 3 minutes. Drain, reserving a ladleful of water. In a large nonstick skillet, heat 2 tablespoons EVOO, 2 turns of the pan, over medium heat. Add the chicken and cook, turning once, until deeply golden, 10 minutes. Transfer to a platter and cover with foil. Add the remaining 1 tablespoon EVOO, 1 turn of the pan, to the skillet. Add the sliced lemon, garlic and capers and cook for 2 minutes. Stir in the wine and parsley and cook until reduced, 1 minute. Lower the heat and bring to a simmer. Stir the chicken broth into the sauce for 1 minute. Stir in the butter until melted, then stir in the lemon juice. Spoon a little sauce over the chicken. Add the spinach to the remaining sauce in the skillet and cook until wilted. Add the reserved pasta cooking water. Stir in the pasta and toss to coat; season with salt and pepper. Add the remaining 1/4 cup cheese and toss. Serve the pasta with the chicken. I use Wegman's Italian Blend fresh grated cheese. The recipe is still delicious without the parsley (why can't I remember to buy it?). I often skip the pasta, and serve it with roasted asparagus (or other vegies) and a salad. 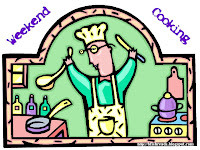 More Weekend Cooking posts can be found at Beth Fish Reads. 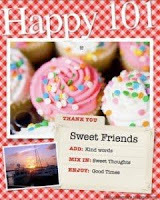 The Happy 101 Award came to me from three fabulous bloggers! First is Dana at Rantings of a Bookworm Couch Potato. She is a new blogger that has jumped right in. She has great taste in books, writes a wonderful review, and has already made lots of friends. Stop over and say hello! Deb at Readerbuzz reads a LOT of books! She is a librarian and is especially passionate about children's books. Her latest project involves 1001 Children's Books You Must Read Before You Grow Up. Be sure and check it out! Ivana at Willing to See Less is my blogging friend from Croatia. I met her thanks to her review of a Louise Erdrich novel and have been reading her blog ever since. She is a mother and a student, too... quite an amazing woman! Have you met her? 1. List 10 things that make you happy. The Prolific Blogger Award came from Laurel-Rain Snow at Creations by Laurel-Rain Snow. 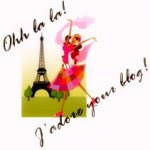 With so many blogs, she is definitely the most prolific blogger I know! 1. Every winner of the Prolific Blogger Award has to pass on this award to at least seven other deserving prolific bloggers. Spread some love! 2. Each Prolific Blogger must link to the blog from which he/she has received the award. 3. Every Prolific Blogger must link back to This Post, which explains the origins and motivation for the award. Accept the award, and post it on your blog together with the name of the person who has granted the award and his/her blog link. Pass the award to 5 other blogs that you've newly discovered. This may be the most beautiful award button out there, but since I've already passed the love around a couple of times with this one, I'm going to focus on Books in the City instead. It's one of the newest additions to my reader and one of my new favorites, too. We have both recently read and reviewed Nine Parts of Desire, share a love of audiobooks (especially by David Sedaris), and have a pharmaceutical background. If you haven't visited yet, please be sure and drop by soon! Whew... that's a lot of love!! Thanks again to all the terrific bloggers for thinking of me, and Happy Valentines Day to all. 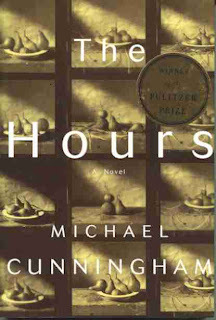 Before I read The Hours by Michael Cunningham in 2003, I was well-aware of the connection to Mrs. Dalloway. Although I'd never read Virgina Woolf, it still seemed like an interesting premise for a novel. Plus, as a Pulitzer Prize winner, it fit in with the award-themed reading I was doing. As it turned out, The Hours was one of my favorite books that year. Cunningham's writing impressed me so much, I immediately read A Home at the End of the World and loved that, too! The Hours earned a spot in my 'permanent collection', and I knew I would revisit it one day. That day came last month. Thanks to a gentle nudge from Woolf in Winter, I finally managed to read Mrs. Dalloway. As I turned the final pages, The Hours was already calling out, so I started it immediately. What was a good story with excellent writing in 2003 became sheer brilliance with Mrs. Dalloway fresh in my mind! The prologue is an imagined account Virginia Woolf's suicide in 1941. The novel goes on to alternate, in relatively short chapters, between the lives of three women: Virginia Woolf, Laura Brown, and Clarissa Vaughan... all connected, in some way, to Mrs. Dalloway. It opens with Clarissa Vaughan leaving her flat in New York City at the end of the twentieth century. Clarissa, 52, is giving a party for her friend Richard (who nicknamed her Mrs. Dalloway many years ago). He is a poet suffering from AIDS and is to be awarded a major literary prize later that evening. The chapters about Virginia Woolf show her in the process of writing Mrs. Dalloway. Laura Brown is a suburban California housewife in 1949 who has difficulty coping with life's demands and is longing to retreat into the world of her current novel (Mrs. Dalloway). If you've recently read Mrs. Dalloway, you must treat yourself to The Hours. You won't be sorry! And even if you haven't read Mrs. Dalloway, this is still a wonderful novel. While you're at it, watch the movie, too. This book is about a 17-year-old boy with an Asperger's-like condition who is trying out life in the "real world" with a summer job at his father's law firm. It reminds me, so far, of The Curious Incident of the Dog in the Night-Time. Teaser Tuesdays is hosted by MizB at Should Be Reading. It's probably not the best idea to read a short story while watching the Super Bowl. If I've learned anything at all over the past year, it's that reading short stories requires a heightened sense of awareness and concentration. So much can be conveyed in just a single sentence. A brief lapse in focus and key elements may be missed. "One dark and rainy Boston spring of many years ago, I spent all my after-school and evening hours in the living room of our antique-crammed Cedar Street flat, writing down what the Ouija board said to my mother. My father, a spoiled and rowdy Irishman, a sometime engineer, had run off to New Orleans with a girl, and my mother hoped to learn from the board if he would come back." "That is what we did, and shortly thereafter, for the first time in my life, I fell violently and permanently in love: with a house, with a family of three people, with an area of countryside." "Roses, Rhododendron" contrasts the idealized outward appearance of a family with the actual dysfunctional state of their relations." I suppose that will have to do. 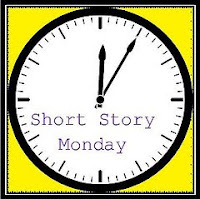 Short Story Monday is hosted by The Book Mine Set. It's a great feeling! You know, when the right book appears at exactly the right moment. It happened to me yesterday at 4:45 PM. The weekend had already been a long one. Friday, we drove out to visit Daughter #1 for her 20th birthday. Our plan was to attend her basketball game, take her out for birthday dinner, head back to the hotel for cake and presents, and then watch Saturday's game before driving home. Well, plans change! Daughter #1 was stricken with a nasty GI virus and missed the game. She slept in our hotel room while we had 'birthday dinner' without her, she rallied for presents and a mouthful of cake (which she managed to keep down), and was asleep by 10:30. Saturday, she was well enough to sit on the bench, but too weak to play. By that time, I was feeling as if I'd been punched in the stomach and figured we'd better skip the game and head home in case things got ugly. Thankfully they didn't, but I was on the couch feeling sick for the rest of the day. I'd finished reading Let The Great World Spin (great book! ), but couldn't seem to focus on anything in the immediate tbr pile. The library called at 4:45 PM to say they had a book for me. A quick computer search of my account showed it was Marcelo in the Real World by Francisco X. Stork. Perfect! There was just enough time for my husband to get there before closing. Now, I'm halfway through this YA title and just love it! Marcelo, a 17 year old boy with Asperger's Syndrome, has been attending a special school and has a job in their stable caring for therapy ponies. He's excited about a summer job that will allow him to train the ponies. His father, however, has lined up a job for Marcelo in mail room of his law firm in the city. He feels it's time for Marcelo to try to function in the "real world", and perhaps even attend a regular high school for his upcoming senior year. Marcelo in the Real World reminds me of The Curious Incident of the Dog in the Night Time by Mark Haddon, a book I loved several years ago. Today I feel much better, but am considering keeping that information to myself. I want to lay on the couch and finish the book! Before that, I'm going to pour another cup of coffee and see what my blogging buddies are up to. Do your plans include a Super Bowl Party? Reading? Or, perhaps you're digging out from "snowmageddon"? The hotel receptionist held my reservation card in his hand. "Mr. Geraldine Brooks," he read. "But you are a woman." Yes, I agreed, that was so. "I'm sorry, but our reservation clerk made a mistake." "That's okay," I said. "Just add an s and make it Mrs."
The receptionist goes on to explain to Brooks that a lady does not travel alone in Saudi Arabia. "There is no reason for it. Unless she is a prostitute." Brooks winds up in a police station where her travel documents and press credentials are verified. The officer says, " I think the lady hasn't been in Saudi Arabia very long. She doesn't know our customs." He eventually issues a permit that allows her to spend the next few hours in the hotel. 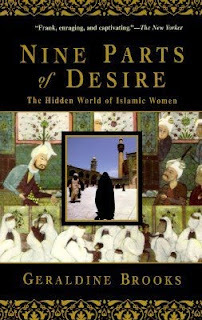 In Nine Parts of Desire, Brooks offers a look at the lives of Muslim women through a series of vignettes gathered while on assignment in the Middle East. She is clear, insightful, and very careful to avoid "the sensational and the stereotypical." Enough historical perspective is included to help the Western reader understand culture and tradition. The book is divided into twelve chapters with each focusing on a specific aspect of life - from veiling, marriage, and education, to business, politics, and even athletic competition. An entire post could easily be written on each chapter. Brooks reflects on how this is the polar opposite of her Catholic school teaching. One chapter is devoted solely to Mohammad - his wives, children, revelations, etc. A detailed account of the Shiite-Sunni schism is included here. Brooks' meetings with King Hussein and Queen Noor are the subject of still another chapter, and make for very interesting reading. It's important to keep in mind that the treatment of and restrictions placed upon women vary widely among countries in the Middle East. Also very important is the fact that this book was published in 1995. The world has changed a lot in the last fifteen years and, after turning the last page, I was left wishing for an "afterwards". Where are these women now? How have their lives changed? 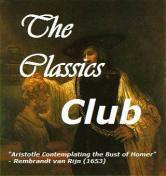 My book club had, as you might expect, a very lively discussion of this book. I highly recommend Nine Parts of Desire. Update: Booksnyc of Books in the City sent me this link to a new afterword found on Geraldine Brook's website. Thank you!! This book won the 2009 National Book Award and I'm starting to see why! Although I began with an audio version, I decided to borrow the book from the library, too. Quite a reading/listening experience! More Teaser Tuesdays can be found at Should Be Reading. Virginia Woolf once said Katherine Mansfield produced "the only writing I have ever been jealous of." Woolf also wrote (perhaps jealously?) "... the more she is praised, the more I am convinced she is bad." These quotes, along with this mention from Paperback Reader, sent me in search of Mansfield's stories. "When dear old Mrs. Hay went back to town after staying with the Burnells she sent the children a doll's house." The house, described in some detail with emphasis on a tiny lamp, is cause for great excitement. The three Burnell children cannot wait to tell their classmates about it. Isabel, the eldest, said she would be the first to tell, but the other two might "join in after". "There was nothing to answer. Isabel was bossy, but she was always right, and Lottie and Kezia knew too well the powers that went with being the eldest." As the other children are told, they gather in a ring around the Burnells. They will be allowed to visit the doll's house in groups of two. "And the only two who stayed outside the ring were the two who were always outside, the little Kelveys. They knew better than to come anywhere near the Burnells." As bits of the Kelvey's history were presented, my heart grew heavier. Lil and "our" Else have not had an easy time of it. The story builds to a climax as their opportunity to view the doll's house presents itself. The most striking feature in "A Doll's House" is that all the children seem to be so aware and accepting of social hierarchy - within the family, at school, and in the village. That leaves the reader with plenty to think about. You can read "A Doll's House" here.